I’ve always been a fan of the zoo. Growing up I went to the Phoenix Zoo on our annual vacations there. It honestly never occurred to me to ask my small town southern Minnesota parents where the nearest zoo was. I just Googled it now to verify that yes, it indeed existed. 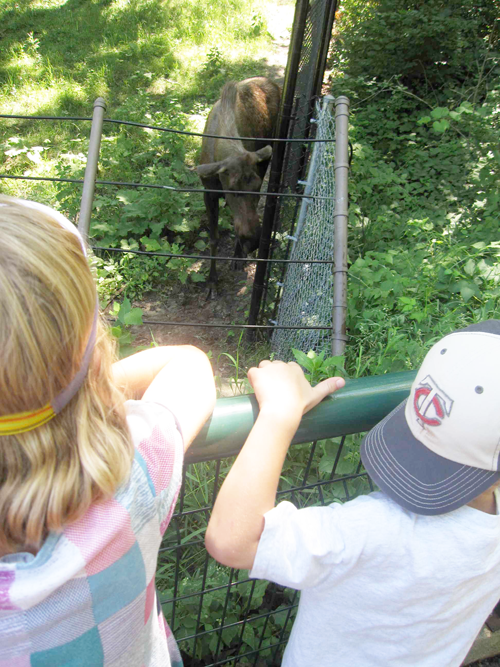 Minnesota’s “New Zoo” opened in 1978. I would say if my parents harbored any guilt about not taking me, they have more than compensated with the annual gift of a zoo membership for our family. I think I also suspected that your typical zoo animals could not survive a harsh Minnesota winter. Zoos were for southern climates. I don’t recall the date or time I discovered a zoo in Minnesota did indeed exist, but I do remember my husband and I paid the zoo a visit when I was at least half way into my 13 days overdue with my first born. I guarantee I waddled around just like the penguins of the new exhibit just opened this July. Fast forward eight years. I still love going. On this particular visit, we went for just under two hours, focusing on the outdoor stuff and a run through of the penguins exhibit. The earthy, organic new Cargill addition connects the Tropics Trail and Discovery Bay portion and allows for a smooth flow at the zoo entrance (plus education rooms behind the scenes). The parking lots are full around 12:15 on a Sunday when we arrive (later than I’d usually go). I was a bit concerned it would be too crowded, but the member line is a breeze and there is a 25 person some wait in the other line. I also reasoned that my 6 and 8 year olds could outlast the tired toddlers that would have to leave by 1:00 for afternoon naps. First up, a visit to the penguins who are the hype of the zoo’s Do the Waddle promotions. We were curious to see if they lived up to their tagline of Cute. Cuter. Cutest. (Yes : ) Post visit we learned that a group of penguins is actually called a waddle. We got up close and leaned in to observe them among the crowd. They blinked intently. No waddles were witnessed. What had I expected? Marching, like in the movie of the same name? Maybe they are just adapting to their man-made environment and eventually their comedic side will shine. Calvin, my 6-yr-old, said he saw one playing dead. Joke’s on the crowd I guess. Then we do the Northern Trail, checking in on all of our favorites who are pretty lazy for midday in the summer. We see the otters and grizzlies of Russia’s Northcoast exhibit, and the warthogs, cheetahs, tigers, takins who are all sleeping or lounging. 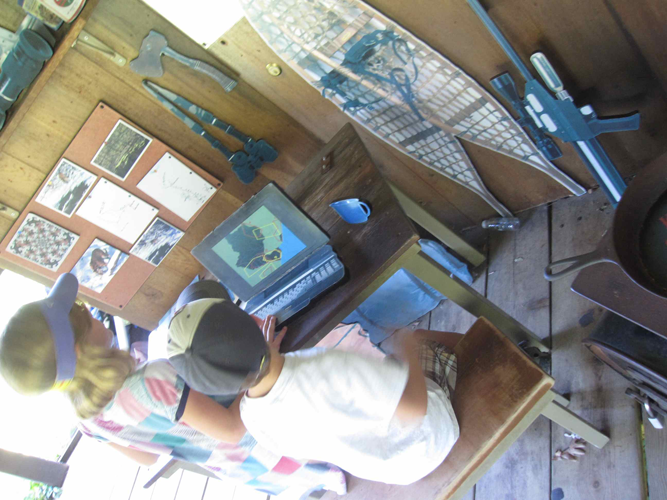 We spend some time working the tiger tracker and at the zoologist’s desk in Tiger Lair Central. The bison and bactrian camels are all trying to keep cool in the algae-thick shallow pools. There is minimal movement, but most of the animals are close or within spotting range. Today, we bypass the Wells Fargo Farm with more of the farm animals. I’d vote to go when it’s cooler and maybe over the August 6 and 7 weekend, when they have special stuff going on out there. If you don’t make it, there’s always their scientific research program Who Pooped, to check out online. Moving along, we spot a moose at close range. Overhead, the Monorail creeps along at such a slow pace that we’re keeping up with it. They occasionally stop to point to animals in camouflage. We come around the backside of the Tiger Lair, then reach the oasis of family fun. This time we’re prepared. The kids change into their swimsuits, then zip in and out of the sculptures in the fountain area, nearly knocking over some toddlers. Completely cooled off, but hungry, we bypassed the playground area with the mosquito and spider inspired apparatuses in favor of a picnic lunch. We fetched our cooler from the car and set up to picnic at one of the several tables in the landscaped area complete with trees for shade, between the parking lots. Sure solves the issue of kids not wanting to leaving the zoo too soon – food awaits! After a two hour visit, we left plenty to do for other returns. What probably doesn’t happen much in Phoenix at their zoo is a change of seasons and resulting change in animal behavior. Here in Minnesota, more so. We’ll at least visit four times a year – in the cooler temps some animals are more active and that’s also when we check out all of the indoor exhibits, maybe head to the IMAX, do the waddle. 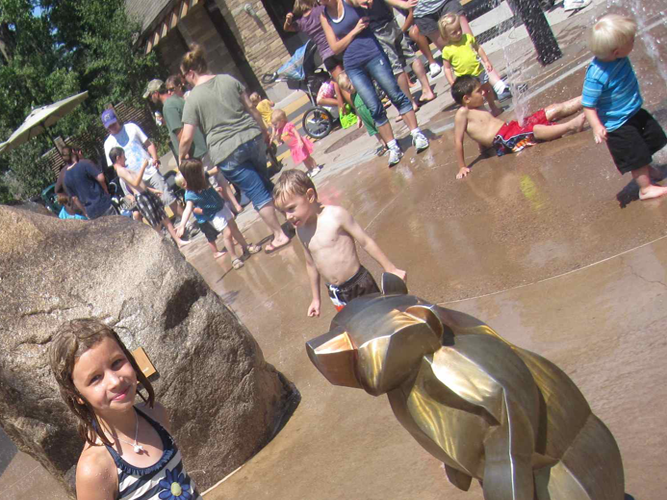 Whatever the case, for this family of zoo fans, membership definitely has it’s perks. After flower-box burnout several summers running, I opted not to plant any type of living thing this summer in a garden, flower box or other. For some, this is unfathomable. For me, it’s being realistic. And ironically since I’ve let go of abundant garden dreams, two other opportunities have come my way. The first is the CSA (Community Supported Agriculture) I just joined. Our family now gets a weekly delivery from Hay River Farms in Wisconsin. Second is the community garden – Bethany Gardens – my son’s school started this past winter (indoors) and spring (planting outdoors). Our family can sign up for times to help with gardening tasks per the direction of a master gardener. For now, I like to think I’m working backwards a bit and maybe someday I will have the tools and experience to have my own successful garden. Through the CSA we get about 20 different items a week, about half of them are known. Most are a variation of a well-known veggie. Take for example the yellow cucumbers, golden beets and red garlic. With each delivery, an email lists the items, some simple ways to prep them and links to a video Farmer Jim creates each week. Jim is living the dream from Farm to Table as they say. Recently we received some good tips on how to best store the veggies (the highly scientific spritz of water, insert into fridge) and dismantle the veggie box for reuse. In the first three weeks, I’ve used about 75% of the box. I plan to improve on this. 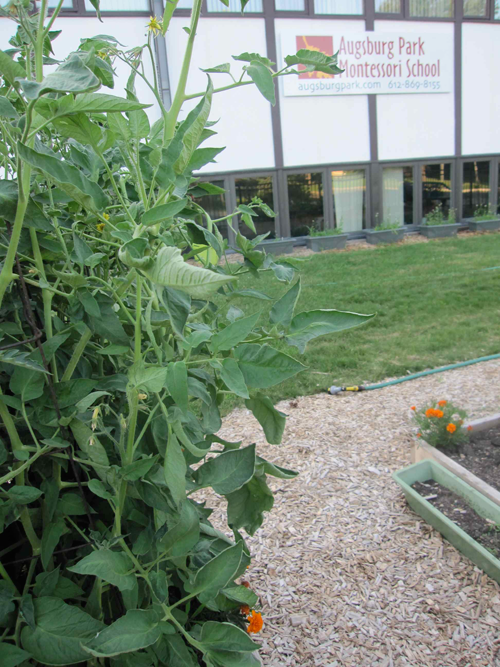 The school-based community supported garden is in Richfield. Child garden labor is cheap, textural (water and dirt make mud after all) and couldn’t be more rewarding for the students at Augsburg Park Montessori School (AMPS). The kids agree on what to plant and all pitch in daily during the school year in gardening activities, in the early phases, just observing and talking the plants into growing in their indoor greenhouse stand. At age 6, my son has totally surpassed my gardening abilities. 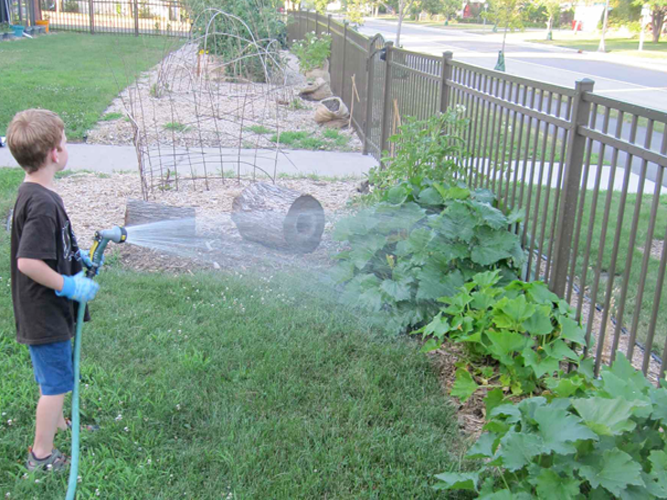 On a high heat-index July eve, we took our list of four to-dos from Megan, the master gardener, fetched our gardening gloves (mine looked to be in very good condition) and headed to the garden. We arrived later than we planned on purpose, due to the heat. Quite honestly, we only got the watering done. Then I had a meeting at the school. So I guess technically I only rolled out the garden hose and turned on the water. Calvin, my son, took care of the rest. 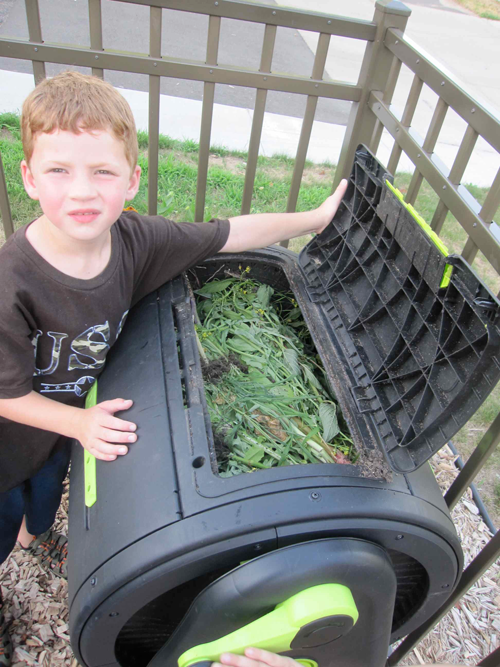 He also told me all about composting and was eager to check out what was in the bin. Possibly the convergence of the CSA and CSG will max out my gardening and culinary capabilities, which I’d be okay with. At least my kids will have some knowledge and experience in both areas. And going forward, I’d have them to share in the work and enjoy rewards. Or take the blame for a bad crop. I hope they’re taking good notes. Summer camps of all sorts are in full swing. We’ve done them all from YMCA to FAIR from Spanish to Stages. Recently my 8-yr-old daughter took a week-long break from the Classic TaeKwonDo day camp both of my kids have been attending to explore her theatrical side. This theater camp, offered through Hopkins Stages Theater, does camps all summer long for kids in three age groups (4-6, 7-13 and 13-17) with varying themes. I missed their 2010 season, so was quick to sign up in February for one of their 2011 camps. We also enlisted a friend. 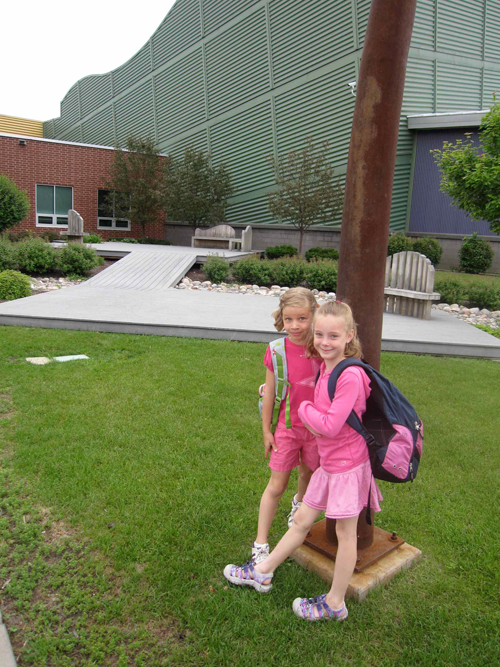 The Holmes class and other classes for 7-13 year-olds were not located at Hopkins Stages, rather at FAIR School in Crystal, MN. The extent of the research I did on FAIR involved a quick check to discover the week-long workshop was held from 9:00 – 3:30 daily and it was 15 minutes from my work. We booked the camp as well as the 3:30-4:30 daily childcare. I was still curious about the location, but put that on the back-burner for another four months, until the Monday morning of camp. 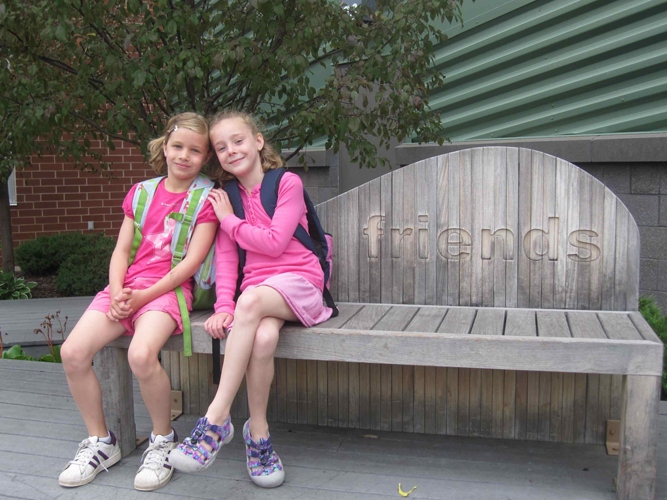 We approached the school, set in a suburban neighborhood with a site that brushed up to a wooded nature area. Since we arrived at 8:15, we had plenty of time to explore. The colorful purple, yellow and orange structures screamed creativity and boldness, while the prairie and serene landscape invited you to enter with an open mind. Inside, the shared common areas of the school and classrooms were light-filled with visual connections to other spaces. Many of these in playful ways like the box windows of varying heights that allowed people to peer into a performance area or circle windows popping out, connecting to exterior spaces. 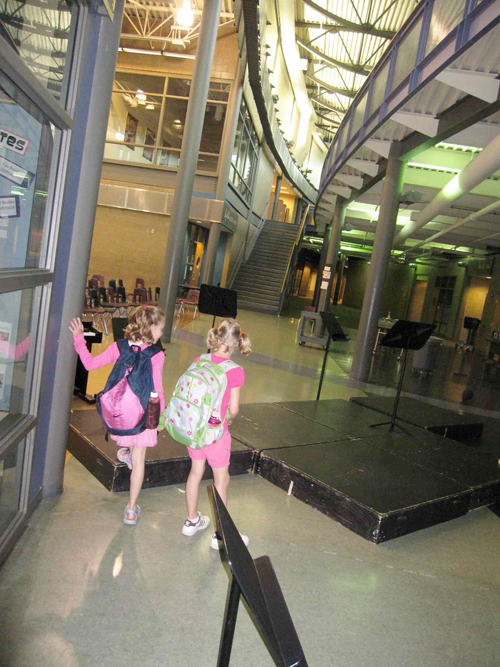 The girls marveled, “This is the coolest school ever,” as they zig-zagged between rows of lockers, checked out restrooms just for fun, ran to capture views out of windows and climbed the school’s staircases. I learned that FAIR School, a magnet school for grades 4-8 that opened in 2000 as part of the West Metro Education Program (WMEP), focuses on an arts education that gives students the opportunity to actively engage in culturally relevant and student-centered curricula. They state that they follow an interdisciplinary approach that allows students make cognitive connections across several disciplines. I could see how that could happen. Everything felt interconnected. I had a good vibe from this learning environment and I’ve toured lots of them. All of this prior to theater camp even starting. It’s 9:00 so I bid the girls a dramatic day and head off to work. Since Ava’s friend’s parents and I are sharing in dropoffs and pickups, it makes the timing and arrangements more manageable – its a strategy I employ often. Each evening there are re-enactments. Ava even writes a story about her character, Licorice, a white chocolate lab by her definition. By Wednesday morning the early-arrivers are engaging in impromtu charades. At week’s end, the group of 7-13 year olds have developed their characters and the plot that they will perform for an audience at the finale on Friday afternoon. When we recap the week, she recalls learning about actor-neutral (which means looking at-ease while you have a non-speaking part on stage) and creating the story. A story that involves a girl falling through a magic mirror and the quest to solve the mystery of the missing jewels between the two opposing groups: The Rockers and the Candylanders. On Friday, her Dad, Nana and Papa all witness her acting skills as a puppy. I hear she barked well. We’ll be doing acting camp again next year through Stages – its a good confidence builder. It was also a great way for her to spend some quality time with a friend she hasn’t seen all summer. 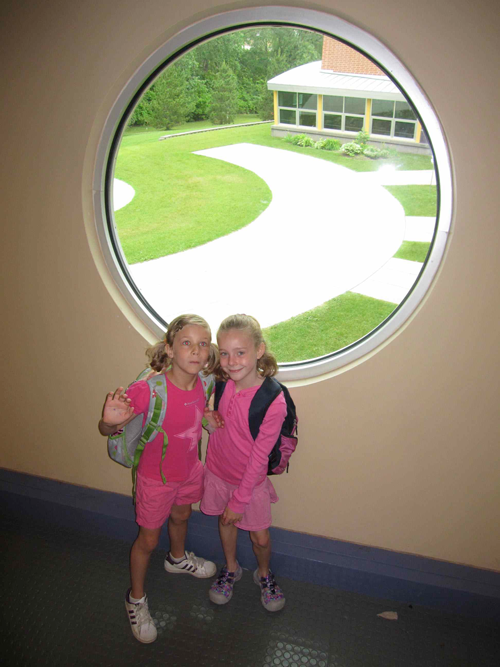 They color coordinated outfits for the week after they discovered they were both in pink on day 1. As for the school, we’ll be checking out FAIR as an option. It remains a mystery if the acting coaches tried to push her past the panting puppy role. It would have been nice to witness a little Ms. Nancy Drew super-sleuthing action. Unless you’re a professional shopper or have several trips to Ikea under your belt, I have some insight to offer that could be useful. 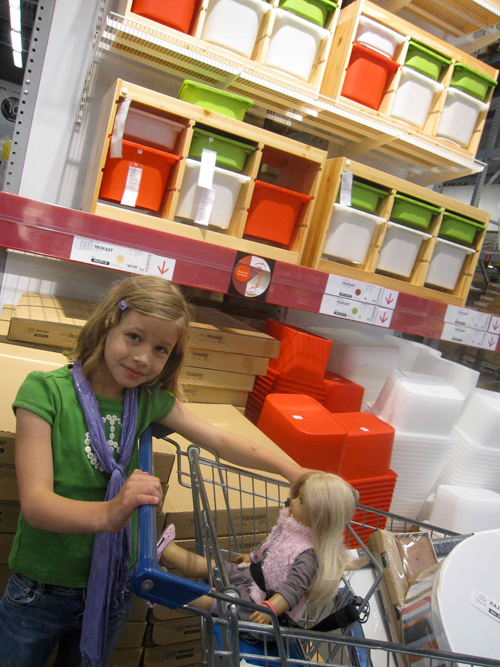 Since Ikea came to the Twin Cities about five years ago, I would venture to say we’ve been there about 20 times. The key, as with many over-sized shopping experiences, is not only to pre-shop but to measure, make a list at home as well. And finally, when entering the store: be realistic, allow time to hit all the shopping and warehouse areas, lower your expectations and go in with high energy and decision-making powers. It was a summer Sunday morning and my Mom, daughter and I were on a small home improvement project kick. My parents’ extended stay of five days opened it up to actually take action on the projects we talk about but never get to. So while the boys worked on exterior project, us girls lit up at the prospect of a visit to Ikea. I pulled out some pictures that needed framing and a set of five wall hooks from a previous overly ambitious Ikea trip months ago. Where to commit to hanging those hooks? Goodness knows without a modern day mudroom, this family is challenged. We brainstormed a bit and opted to look for additional hooks so one set could go in each of the kids’ rooms. An ah-ha moment. We also measured the distance from the floor to my son’s bedframe – we’d be ready to pounce on the perfect baskets that would clear the opening. The list was comprised of frames, hooks and baskets. 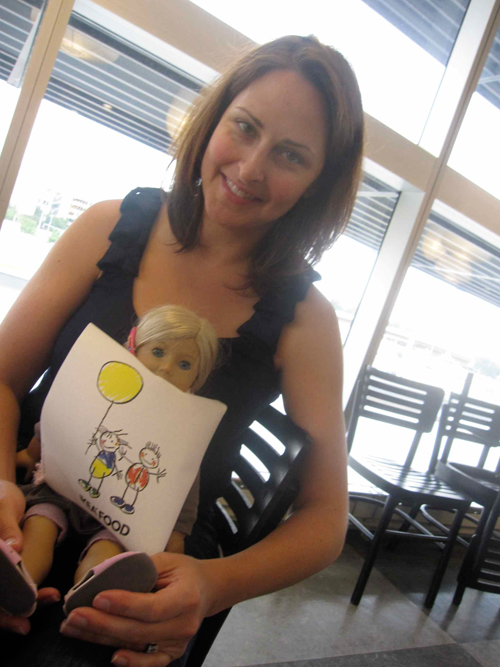 For a fourth opinion, we brought my 8-yr-old daughter’s American Girl doll, Mia, with us. We arrived about 15 minutes prior to store opening and headed for the Ikea Cafe. I’d eaten here just months ago with daughter Ava for breakfast. I assured Mom, this would be a value-driven meal. 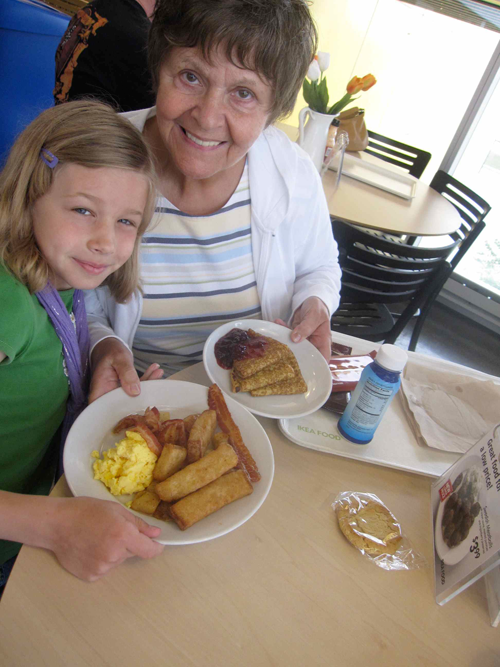 $1.99 for eggs, bacon and french toast sticks (2 orders) and coffee, an order of Swedish pancakes with lingonberry jam, chocolate and cookies (for later!) all for less than $9.00. I already feel obligated to spend $30 shopping. The cafe is clean, bright and optimistic. It feels European, yet like a neighborhood cafe. I even run into a friend who’s there in search of a toddler bed. I can’t help but give her some advice. At store open time, we shop. As tempting as it is to go through the entire top floor, which is furniture and larger ticket items, we do a quick run-through of the Children’s section on Floor 2, then head down to Floor 1 for home accessories. I pick up an outdoor rug ($5) and briefly scan the lighting possibilities to see what’s new. In framing, I find a three picture opening frame ($14) for 5×7 photos and decide I can make my 4×6’s work with some clever matting. We move on to search for a set of hooks to match the others – no easy task – they’ve moved, but luckily they still have them ($10 each). Note: turnover is high here – if you have any inclination you’ll come back to get matching items of a set or more of something, don’t count on it. We get a little caught up in framing – no luck finding the odd size frame for a USA map of my son’s that needs a 20 by 38 frame. I let it go, we move on. Baskets are next. I check out wicker baskets that I saw on the last trip that would fit under Calvin’s bed. They are still $20 a pop and I’d need three. I decide to wait. Risky, I know. If you think you’re done shopping when you hit the warehouse entrance, this is a rookie mistake. Everything is displayed as assembled and you might find some things you missed in the furniture section. Or maybe you’ve carefully marked what aisle and bin to find your items in from your shopping tour only to find out that they’re sold out or discontinued. Disappointing, but that’s how it might go. Proceed to checkout. Don’t be afraid: do the self-check-out, especially if you have an impatient child. Ava loves to scan, she’s got a knack for it. We don’t have a kid to pick up in the play area today (in the past, I’ve checked them in there while I shop – slick! ), so it’s an easy exit to the lot. I think we spent about 1.75 hours there. Over the next days, we paint the wooden boards that will hold the hooks – green for Calvin and hot pink for Ava – to match the stuff already in their rooms. 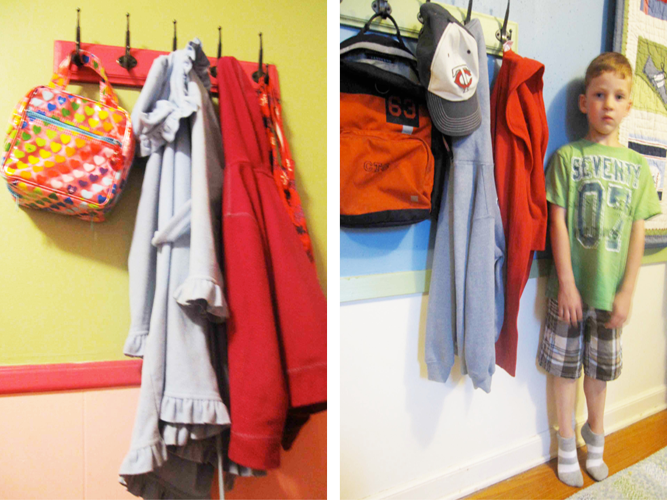 No more excuses for stuff on the floor – the five hooks have two prongs each, so 10 places to hang towels, backpacks, robes, hats and lunchbags. Each board needs three coats of paint. We plan out positioning from floor and location behind each door. Papa assembles them the next day, while I’m at work. A satisfying two-day turn-around on that project. What’s your Ikea experience? How do you shop there? Do the store and products give you inspiration or make you overwhelmed? Scale of 1 to 10, 10 being brightest, is Ikea a good idea?